As a wangler we get a variety of riders. Including first time children who either have no fear, or are terrified by the thought of horses. 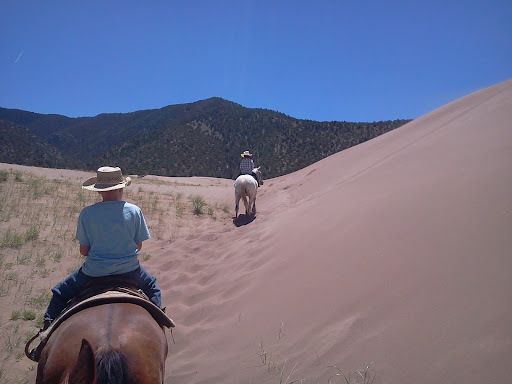 I had a mix today and took this picture of two of them riding the dunes right before Charlie flipped me over his right shoulder while lunging through deep sand. Two of the boys thought it was awesome when I did a somersault and landed on my back in the sand. One of them froze in fear. Nice. Thank God it was deep sand or I'd be a cripple. I know his bucking is a pain issue with a poorly fitted saddle. I'm sure as he lunged up the dune it slid and pinched him. He has crazy high withers and I cannot find a good fit thus far. But I'm working on it. I spent the rest of the ride convincing this kid his horse wasn't going to do that and he could take control rather than have his grandfather lead him on a halter. It worked and he picked up the reins. Yeah me. It's horrifying coming off in front of guests. But...I've found I usually make killer tips when I hit the ground. I still don't like it, great tips or not. Well, I guess if you have to come off, doing so in the deep sand is a better option than some!